Reusing content can be beneficial, but complicated to manage without proper guidelines. You can reuse content on many levels and apply different methods, from conditional filtering on entire maps to variable phrases for single words. 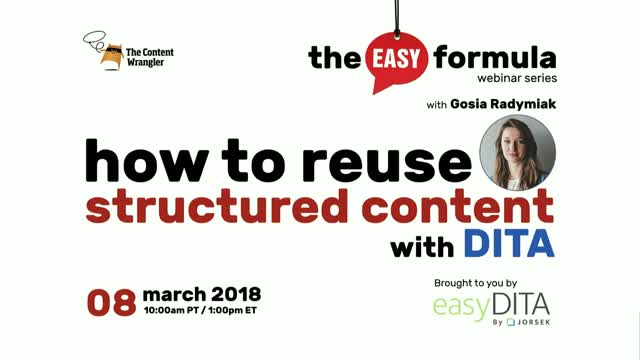 Join guest host Paul Perrotta, and our special guest, Gosia Radymiak, Customer Success Manager at Jorsek LLC, the makers of easyDITA, for this free, one-hour webinar. In this webinar, attendees will learn how to 1) review reuse mechanisms available in DITA; 2) learn about reuse best practices, including content organization and localization do’s and don'ts; 3) learn how to create a reuse strategy suitable for your content; and finally, 4) to get links to useful resources about DITA and reuse, including articles and training.